With over 20 HIMSS conferences, 10 Health Evolution Summits, and somewhere in-between as many times hanging out in Union Square for the JPMorgan Conference under my belt (not to mention eight or nine times to Health 2.0), I really wondered what the point of another event was – especially as I just described part of how I spend each January, February, March, and April. That doesn’t count all the other conferences I occasionally attend, such as ANI, AHIP, or RSNA. Oh, and add in the fact that I felt like I’d already paid my Vegas dues for the year. 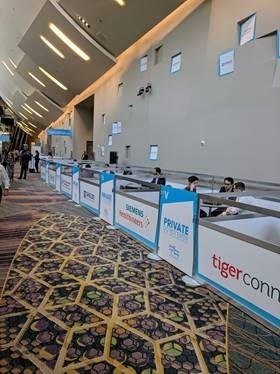 Still, having seen countless ads, been asked if I was attending by over a dozen friends and colleagues, and more importantly, written about most of these events for this column, I decided to head to Vegas to see what HLTH’s inaugural conference was all about. 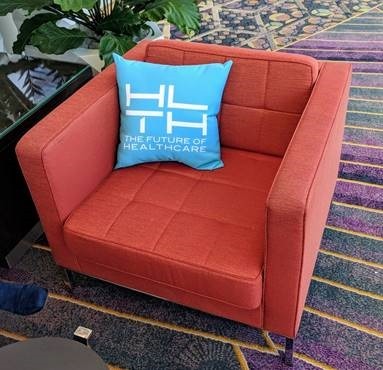 All in all, HLTH’s inaugural conference attracted 3,500 attendees, which according to its media briefing, included 600+ founders and CEOs and 1,600 companies. Thirty-eight percent of attendees were from the C-level, 35 percent were from potential purchasers (payers, providers, and employers), 20 percent were investors, and 15 percent were media from such notable outlets as NY Times, Bloomberg, CNBC, and yes, HIStalk (yours truly.) Just to give a sense of scale, HIMSS and JPMorgan “convene” tens of thousands, while Health Evolution Summit admits fewer than 750. To answer the “why another conference” question, I asked Nancy Brown, a venture partner at Oak HC/FT (the aforementioned venture fund) and good friend of over 15 years. Oak’s investment in this conference is particularly noteworthy for several reasons. Oak’s managing partner, Annie Lamont, is arguably one of the best healthcare investors ever, with such hits as Athenahealth, Castlight, CareMedic, and more than a few other successes. Annie knows healthcare and how to invest. Next, Nancy Brown’s substantive knowledge of our beloved sector would be hard to overstate as she was a serial entrepreneur (co-founder of Abaton.com, chief growth officer of MedVentive) and developer of Athena’s clinical products in between before going to the venture side. When Nancy told me she had curated the content for HLTH, I had to sit up and take notice. My instincts were correct. Many attendees commented how strong the content was and the breadth of tracks and sessions made for tough choices, a conference rarity. While a sponsoring company’s CEO observed to me that HLTH “had more TED Talks than people there to do business,” that’s not necessarily a bad thing, especially as it helps draw people to the event. Some presentations were more company pitches than substance, but I still give it an A+ for content and I’m a tough grader. A banker friend of mine who’s been an operator and investor observed that the sessions “with their common focus on disruption and innovation, were brilliant due to the speakers.” The 375 speakers were either on small panels with multiple views or served as solo speakers. These folks were predominantly CEOs and other C-level executives. Part of the formula was that they were specifically encouraged to make it fresh and interesting rather than reusing their typical pitch or speech and/or to use HLTH to make announcements involving new products, venture funds being launched, and collaborations. OK, great content, but that doesn’t say why we need another conference. HLTH’s founders have a track record. Jon Weiner and Anil Aggarwal, who are also venture partners at Oak HC/FT, founded and sold two successful conferences: Money20/20 (fin tech) and Shoptalk (commerce). They seem to have observed how many healthcare conferences exist and the need to consolidate attendance. The goal appears to be to create content that draws people into a setting and further helps both “convene” and encourage good and serious conversation among the participants. I think they nailed it. As I’ve written about JPMorgan, it’s not about the conference, it’s about seeing other “attendees.” I use the quotes because not all are even officially attending – they’re hanging around Union Square meeting in coffee shops, hotel suites, or rented conference rooms all day. HLTH, in contrast, deliberately made opportunities for conversation easy. How do you attract people? Start by inviting CEOs and leading sector venture investors (speaking slots help – see content above) and then more will follow. Offer hosted buyer meetings to subsidize the attendance costs of provider. I heard there were close to 1,000 buyer meetings, a Funding Founders VC speed-dating event that involved 300 investor meetings, and more, along with one official and countless other parties each night. It’s all part of the formula that has clearly worked – Money20/20 sold for over $100 million (before an earn-out) and Shoptalk seems to be doing wonders. A brief glimpse at those two websites showed a similar look and feel. Speaking of look and feel, HLTH definitely focuses on UI/UX. A great downloadable app (with schedules and attendee messaging capabilities), excellent food, easy registration, and a really spiffy opening video (with all the stats you might want to see) all made it seem hip, cool and easy, although a few attendees I chatted with expressed concerns that this could change with growth (and a venue shift from Aria to MGM Grand excites no one). Turning to the exhibit hall, it was a reasonable size, where each booth had a somewhat similar look and feel. Sizes ranged from tabletop to small, i.e. no city blocks like at HIMSS or RSNA. They were there to sell, but it felt more to inform as well – I’d be surprised if folks show up to this conference with checkbooks. Vendors included legacy players like Athenahealth and Change Healthcare; newer yet established ones like Castlight or Teladoc; new entrants like Lyft; quite a number of very early-stage companies seeking to launch; and quite a few of the usual suspects. Each time I wandered through the exhibit hall, a decent if not overwhelming number of attendees seemed to be browsing through it. Utility for exhibitors seemed to vary based on their target customers. Chats with some employer- and plan-focused vendors yielded mixed reviews with a slight positive bias. The proof there will obviously be how many sponsors and exhibitors re-up for 2019. For vendors, I’d call this a marketing and business development event rather than a sales one. When I asked a few investors if they would encourage a portfolio company to exhibit, the impressions were equally mixed, with a positive bias. Bottom Line: What is the Future of “The Future of Healthcare”? I confess, having spoken at a few proprietary conferences over the years and been consistently underwhelmed, I was skeptical on my flight to Vegas. That said, I was pleasantly surprised, as were most people I spoke with. More than one attendee compared it favorably to both JPMorgan and HIMSS. “HIMSS is a CIO conference and HIMSS is a noun. This conference is more of a verb,” one thoughtful attendee and loyal HIStalk reader stated in summation. Speaking from the Investor’s Chair, I don’t think HLTH will displace JPMorgan as “the Burning Man of Healthcare” any time soon, especially for later stage companies, but I see HLTH as a great addition and have already encouraged a protégé to try to attend next year as a way to broaden their industry exposure and grow their personal brand. That said, it’s not clear how many organizations will pay for their employees to conference-hop the way the C-suite does, although one sponsor I spoke with specifically commented on liking the prevalence of more day-to-day workers vs. CEOs. The challenge I see is twofold. 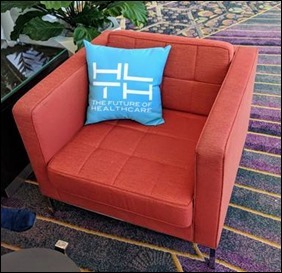 First will be keeping the great user experience as HLTH grows, given that the first time out of the gate almost 3,500 people were in attendance. If everyone wants intimacy and everyone wants to attend, those goals ultimately conflict. I’m curious if the formula has an answer to that dilemma. That said, the founders’ other two conferences seem to be going strong. Second is competition. HLTH competes with the other conferences I mentioned (to name a few) for the cost and time required for CEOs and investors to attend. From JPMorgan to HIMSS to Health Evolution and now to HLTH is distracting and tiring. Fall might have been better for scheduling purposes. That said, I predict success given the buzz it generated, the quality of folks who attended, and the all-powerful FOMO (Fear of Missing Out) as a go-forward motivator. Ben Rooks, to his surprise, has at this point advised companies through ST Advisors longer than he was an equity analyst (10 years) or an investment banker (six years). When not writing for HIStalk, enjoying leisure time, or attending conferences, he actually does real work. He’s grateful to Premier for sponsoring the Headshot Lounge at HLTH (another nice touch) because he wanted a new one. That’s it. Next time that Rooks fellow has to pay for his ticket to Health 2.0! !